Something a little out of the ordinary this, a novel about fishing and war. John Langridge’s tale is based on the fragmentary, but unfortunately all too true story of a man who found himself caught in the maelstrom of the Spanish Civil War, one of the most bitter conflicts ever fought due to the confused motives and alliances of the two sides. Lizzaralde had the misfortune to experience some of the worst excesses of the war and this touching book tells the story of how it affected his life in a series of reminisces told during a day’s barbel fishing. The enormous change war wrought in twentieth century Spanish society is brought out extremely well, reflected in the main character’s changing fortunes. 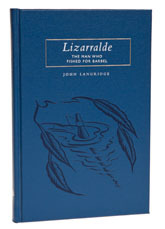 No, Lizzarralde isn’t really a fishing book, though there is fishing in it, but those readers who have reached the seventh age of fishing will understand why barbel kept the hero’s spirit unbroken. A good holiday read – with all the usual Medlar quality, this is a nice book to handle, let alone read.